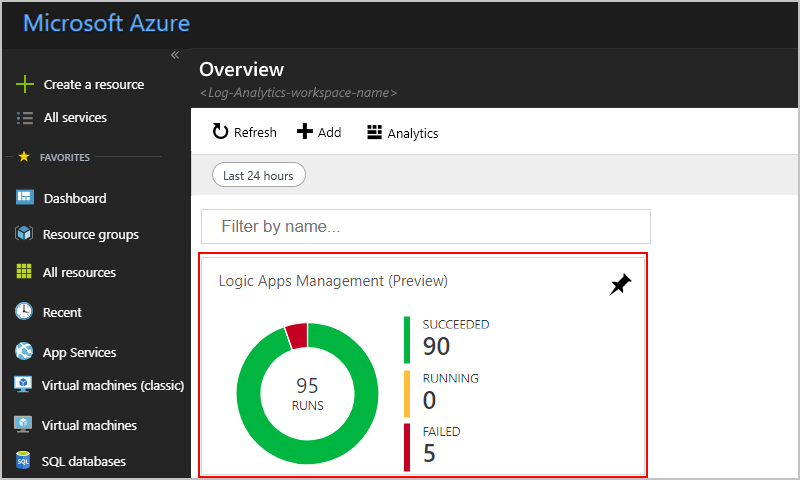 To monitor and get richer debugging details about your logic apps, turn on Azure Monitor logs when you create your logic app. 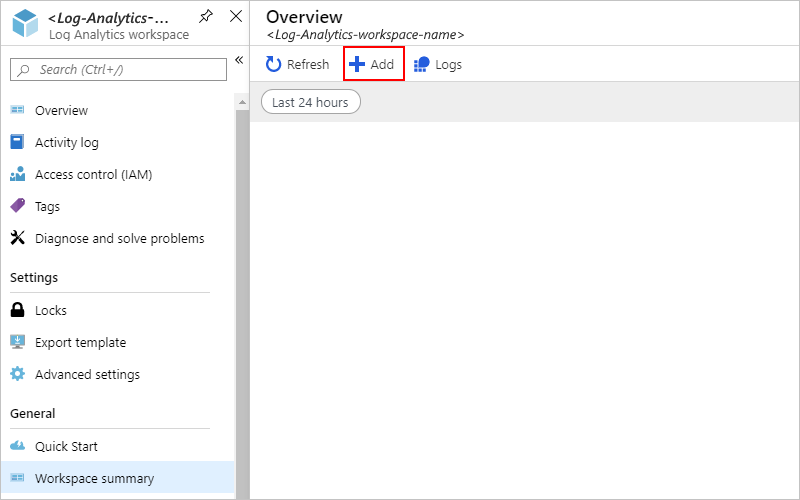 Azure Monitor logs provides diagnostics logging and monitoring for your logic apps when you install the Logic Apps Management solution in the Azure portal. This solution also provides aggregated information for your logic app runs with specific details such as status, execution time, resubmission status, and correlation IDs. 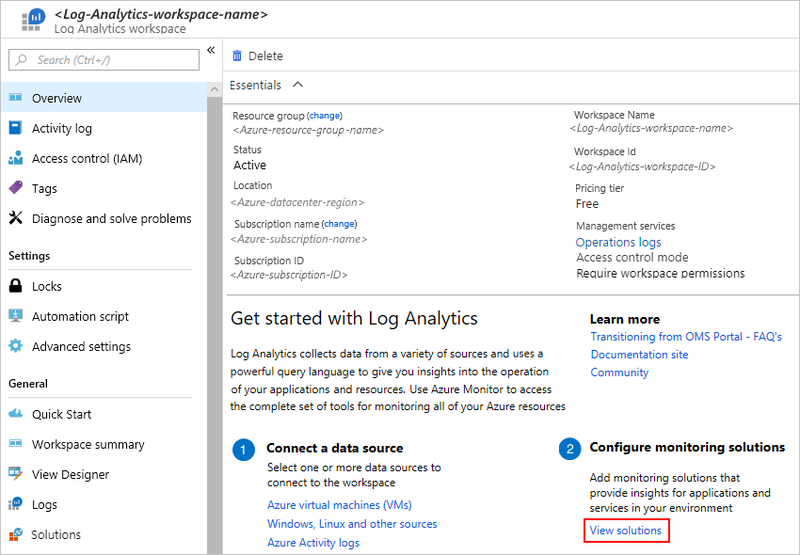 This article shows how to turn on Azure Monitor logs so you can view runtime events and data for your logic app runs. 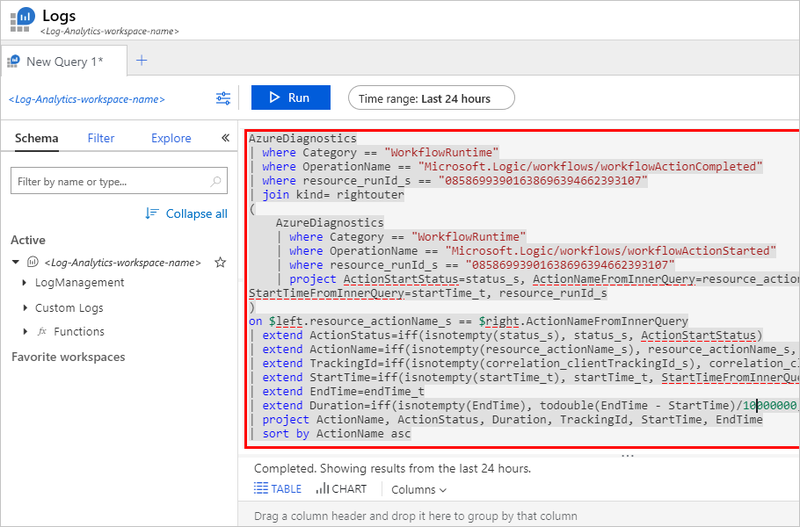 To turn on Azure Monitor logs for existing logic apps, follow these steps to turn on diagnostic logging and send logic app runtime data to Azure Monitor logs. 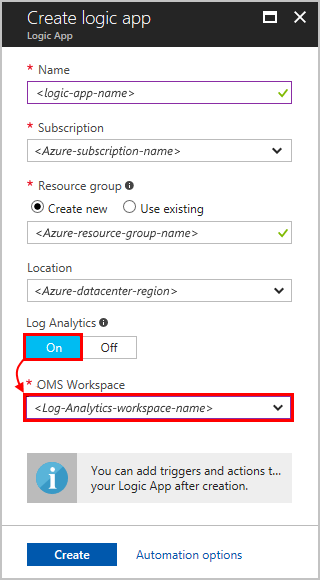 This page previously described steps for how to perform these tasks with the Microsoft Operations Management Suite (OMS), which is retiring in January 2019, replaces those steps with Azure Log Analytics instead. Before you start, you need a Log Analytics workspace. 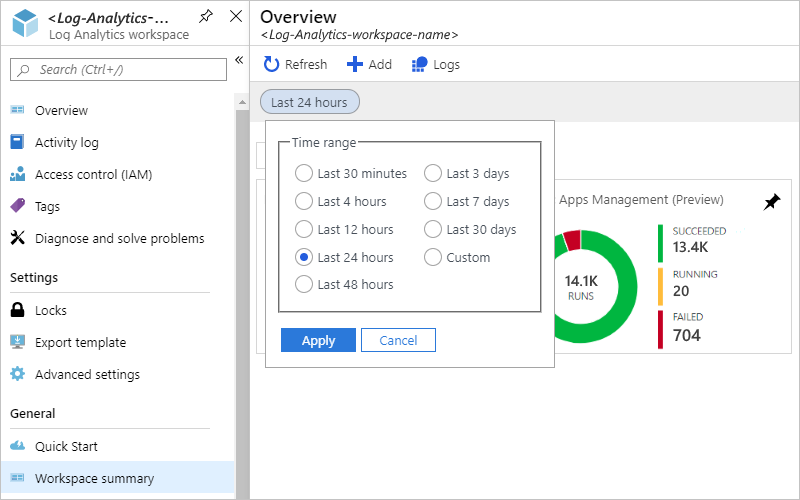 Learn how to create a Log Analytics workspace. 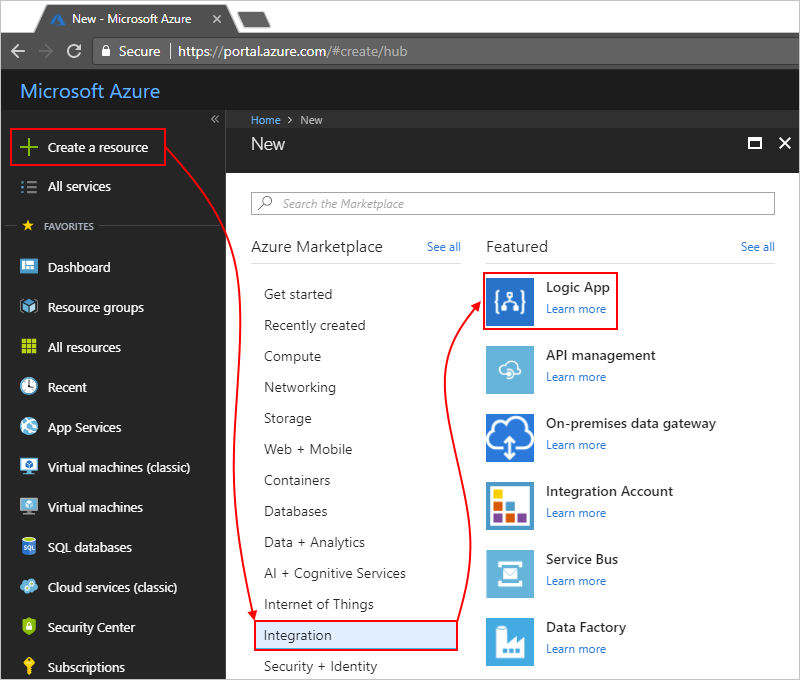 In Azure portal, create a logic app. Choose Create a resource > Integration > Logic App. Provide a name for your logic app and select your Azure subscription. Create or select an Azure resource group. Set Log Analytics to On. From the list Log Analytics workspace list, select the workspace where you want to send data for your logic app runs. After you finish this step, Azure creates your logic app, which is now associated with your Log Analytics workspace. Also, this step also automatically installs the Logic Apps Management solution in your workspace. To view your logic app runs, continue with these steps. 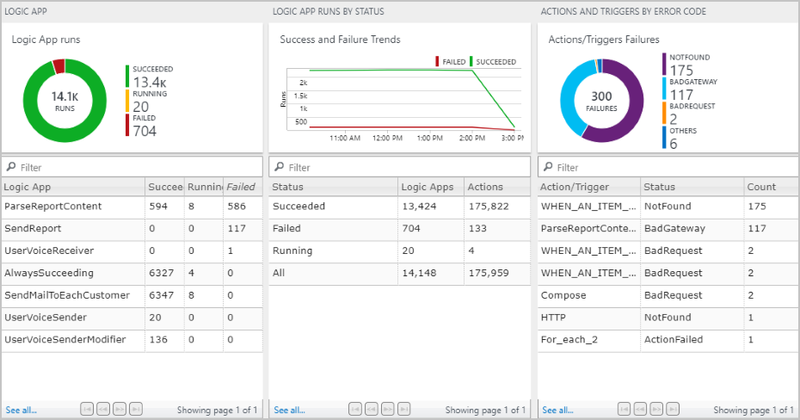 If you already turned on Azure Monitor logs when you created your logic app, skip this step. You already have the Logic Apps Management solution installed. In the Azure portal, select All services. In the search box, find "log analytics", and select Log Analytics. Under Log Analytics, find and select your Log Analytics workspace. Under Get started with Log Analytics > Configure monitoring solutions, choose View solutions. On the Overview page, choose Add, which opens the Management Solutions list. From that list, select Logic Apps Management. If you can't find the solution, at the bottom of the list, choose Load more until the solution appears. Choose Create, confirm the Log Analytics workspace where you want to install the solution, and then choose Create again. If you don't want to use an existing workspace, you can also create a new workspace at this time. 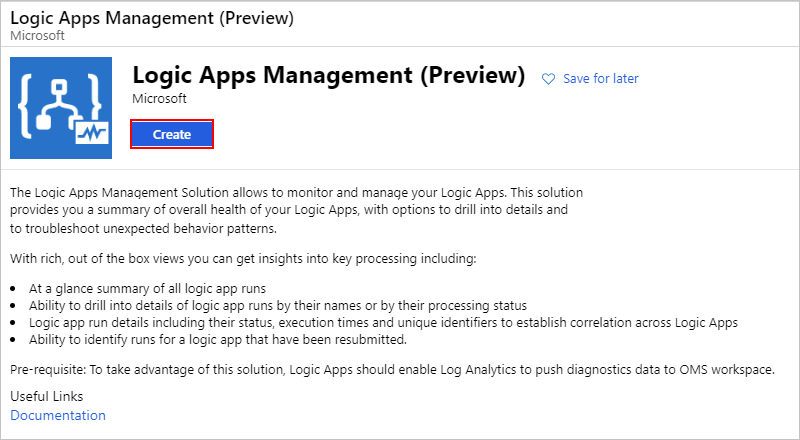 When you're done, the Logic Apps Management solution appears on the Overview page. After your logic app runs, you can view the status and count for those runs on the Logic Apps Management tile. Go to your Log Analytics workspace, and open the Overview page. Choose Logic Apps Management. Here, your logic app runs are grouped by name or by execution status. This page also shows details about failures in actions or triggers for the logic app runs. To view all the runs for a specific logic app or status, select the row for a logic app or a status. This column shows tracked properties, which are grouped by actions, for the logic app. To view the tracked properties, choose View. To search the tracked properties, use the column filter. Any newly added tracked properties might take 10-15 minutes before they appear first time. 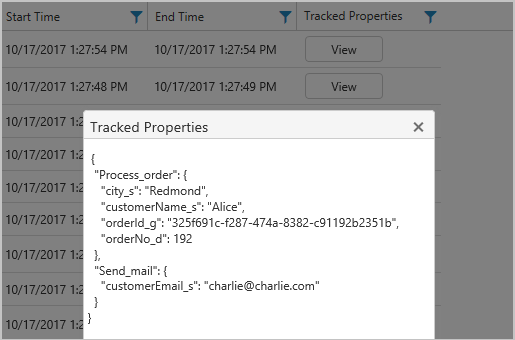 Learn how to add tracked properties to your logic app. Resubmit: You can resubmit one or more logic app runs that failed, succeeded, or are still running. Select the checkboxes for the runs that you want to resubmit, and choose Resubmit. To filter these results, you can perform both client-side and server-side filtering. Server-side filter: To choose a specific time window or to limit the number of runs that appear, use the scope control at the top of the page. By default, only 1,000 records appear at a time. To view all the actions and their details for a specific run, select a row for a logic app run. On any results page, to view the query behind the results or to see all results, choose See All, which opens the Log Search page. To view the query results in a table, choose Table. To change the query, you can edit the query string in the search bar. For a better experience, choose Advanced Analytics. On the log analytics page, you can update queries and view the results from the table. This query uses Kusto query language, which you can edit if you want to view different results.